My knitted fingerless gloves are very "hot" right now so this is for all you crocheter's out there. These are so easy to make and will take you no time at all to complete. My pattern features the instructions for woman's, teen and child sizes for your convenience. Why not make a pair for everyone in the family. The adorable flower adds so much to the gloves. 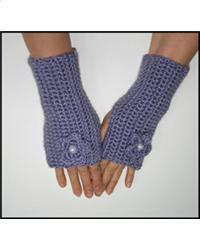 They fit very snug and keep your hands warm while texting on those chilly days.